Another option is to check your recovery points depending how far back they go and how long you have had the problem. try removing the drivers you installed recently as that may well be the issue. Remove one device and restart your PC, Windows will auto install the device again with its own drivers, that may solve the problem if the recently installed drivers you mentioned are indeed the culprit?. As I said, I've been having this issue for a much longer time than two-three days. It's been an ongoing issue since September, at the least. Even after a complete reinstall of, well, everything on this hard drive, it's still very similar to the BSODs I was having before the reinstall. If anything, it would be the drivers I DIDN'T update following the install of Windows 10. I also ran Memtest86 once more, 6 passes this time, and still 0 errors. Chkdsk also didn't seem to find anything it needed to repair, at least not that I noticed, anyway. 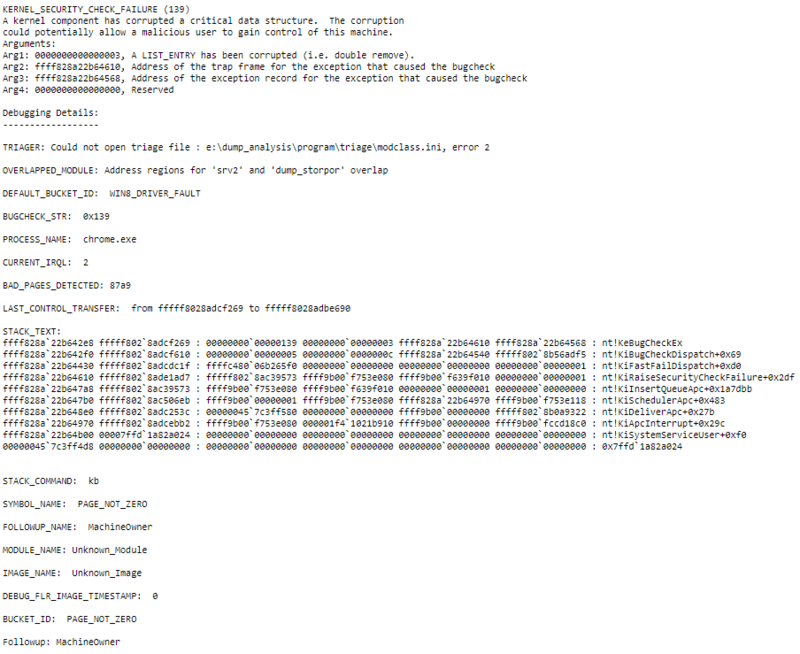 I'm still in the belief it is driver related, but still I've got no idea how to diagnose which driver since I'm willing to bet the next minidump will simply point to the same locations. I guess I'll find out when it happens again. If you're convinced that it's a driver then you might want to try something like "Driver Verifier"
Be sure to read it thoroughly so you understand what it does and how to recover if for some reason you are unable to boot the system afterwards. Considering it put me in a BSOD loop I could not get out of, I'd rather stay far away from it. I could not repair nor could I enter safe mode during that time. I had to completely reset the hard drive just to get it working again. Not only that, but it seems many other people have experienced what I experienced with Driver Verifier on various other websites, such as Reddit. There are other specifics about items to check and other items never to check when using verifier. do you have another GPU?, it may be that the GPU is the culprit?, can you borrow one from a different PC?. I only own one PC. I had a 960, but I sold it after I bought the 980ti in 2016. This might be the problem even though you don't have an RTX GPU, it may be related, if you have a different monitor, try swapping it out??????????. I've run a two display set up for a pretty long time but I think this was my first IRQL error. I believe it said Kernel Security Failure and Memory Management more often, but I haven't had a BSoD since the one I reported yet. It sounds like the BSoDs in his video are incredibly frequent instead of my once per 7-9 day BSoDS, but that could be related to the 20 series in terms of frequency. I also run a very old monitor as my second monitor, I honestly have no idea how old this thing is, all I know is that it was sitting in my mom's basement when I visited and asked If I could have it since she was going to throw it away. If I don't get a BSoD by the 20th, I'll assume that updating a couple of my other (wireless adapter, Intel, and one other one) drivers has fixed it or has at least made it much more stable. I'm also testing some stuff involving Google Chrome and my Ublock Origin extension, but if it crashes again, I'll unplug my second monitor and use one and see if that helps. I may simply need to switch out the old monitor for a newer display. I'm both happy and annoyed the BSoDs happen far in between, as it makes it much harder to test what works and what doesn't but it also isn't a major issue to deal with. I'm pretty sure my PC blue screened while I was in the shower. When I came back to it, it was back on the log in screen and Chrome said it closed unexpectedly. However, I do not have a minidump file in the minidump folder. Even the other minidump file is gone. I also do not see any dump files location in the windows directory. Event Viewer, however, says the PC did reboot without cleanly shutting down first about 20 minutes ago. edit: Windows also did not update itself without me knowing and then shutdown as there are no windows updates listed for having been installed today. Just had a BSoD about 5 minutes ago. This time it's Kernel_Security_Check_Failure. Here's a link to the minidump. Anything in there that would help me understand what's wrong? edit: osronline mentions something with chrome process and WIN8_DRIVER_FAULT, if that means anything. NOPE.... IF anything it is less informative than your previous dump file. Be aware that this one may have you chasing your tail even more. All I can suggest is just hang in there, keep sending the dump files and maybe, sooner or later we'll see an actual culprit exposed. Damn, was hoping there'd be something in there, lol. I noticed a couple things during testing as well and it seems like shutdown to boot has something to do with it, but I'm not sure how it does. I can run my PC and put it on sleep mode for many, many days without an issue, but, yesterday, I got a Windows update and had to do a full shutdown. Following said shutdown, my power flickered about 3 times today in the span of 5 seconds, causing the PC to restart multiple times. I ended up shutting it off and waiting it out to see if the power would keep doing it; it didn't. Turned my PC back on and within 2 hours got the Kernel BSoD. Restarted and then did a full shutdown before turning it back on. Noticed the PC was slow to boot and, once I loaded up Hearthstone (I load Hearthstone to check if it's going to creash, which tells me I should shutdown and turn it back on), an online card game, it crashed, something it only does when a blue screen is about to happen. Shutdown the PC immediately and turned it back on 15 seconds later. It booted quickly and doesn't have the crashing in game anymore... yet. Honestly, it's so confusing what the issue actually is when nothing seems to directly relate to the issue. I suspected maybe my Xbox controller could possibly cause the BSoD by being perpetually plugged in, so I unplugged it a week ago in hopes it somehow was related to the issue, fool's errand maybe, but worth a try. I'll continue to send BSoD dumps. Any thought on why I've had 3 different errors instead of the same one? Nope.... I've actually only seen the two that you provided in links above. Basically I see that they are reporting what might commonly be referred to as "corruption". In other words, it went looking for a particular item that was being held at some location and didn't find what was expected. Back in the day, take for instance the cache module on a hard disk.... IT was just basically a "buffer" to hold things on their way to be written to or read from the disk. Now-a-days it almost behaves like a superfetch device that tries to predict what you are needing and grabs that up and holds it, not only that but it grabs extra items in, around, and near that same location. IF you have a dodgy cache module you might experience something like you're seeing. Now extend that to all possible devices that caches data. Even optical drives have cache modules, fortunately they still behave as read write buffers. So you might get a read or write error from them, it won't generally crash the Operating System. A bit long since I last posted, but the blue screens stopped and were replaced with the system simply buzzing and then shutting down and restarting. No dump files created during this. However, I just received a BSoD, this time it's a DPC Watchdog violation. I read up on it and a guide suggests updating the SATA AHCI controller from storahci.sys to iastor.sys, is this recommended? Also, it says the driver was last updated in 2006, but the driver says it is at its latest update. Would you happen to know what driver I would need to download for the Z97S SLI Krait motherboard?